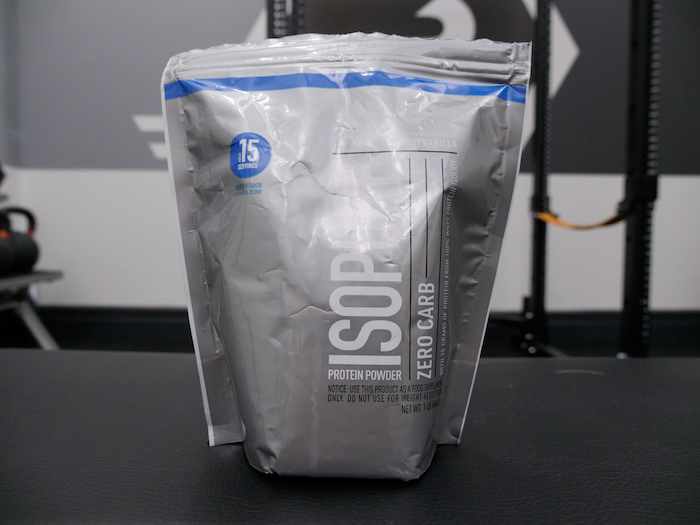 Home » Isopure Zero Carb Protein Powder Review: How Does It Taste? 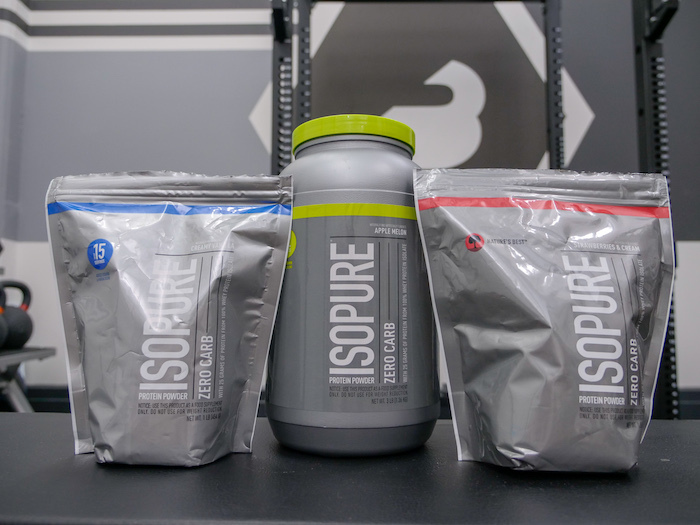 Isopure has managed an ultra-filtered isolate with absolutely no carbs, and it's got a few other interesting benefits. Perhaps you thought it couldn’t be done, but zero carb protein powders are possible and Isopure has the most popular one on Earth. Owned by Glanbia (the same folks behind Optimum Nutrition) Isopure was started thirty years ago by Hal Katz and Ernie Geracie, who used to churn supplements in a cement mixer in their garage, but today they’ve grown into an extraordinarily popular brand that includes translucent, protein-laced water and protein-based nutritional shakes, but they’re best known for their isolates. 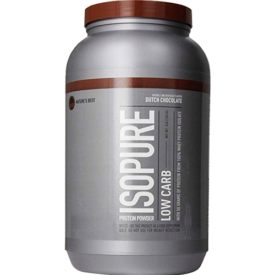 We’ve tried Isopure’s Low Carb Chocolate flavor, which has one gram of carbs per serving, and while there’s no zero carb chocolate we did receive Creamy Vanilla, Strawberries & Cream, and an unusual Apple Melon flavor. 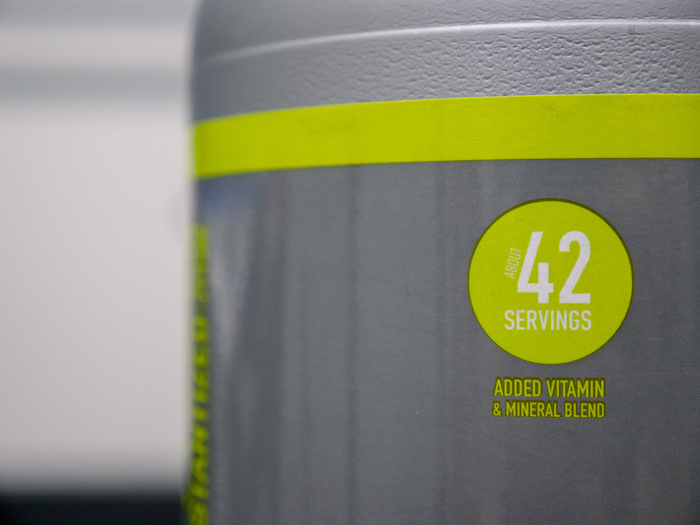 Isopure has really come up with a remarkable protein that’s jam packed with vitamins and minerals and can fit into just about any diet — provided you’re OK with some artificial ingredients and the unusual flavor profile. Completely carb free and packed with vitamins and minerals, Isopure has pulled off a remarkable feat with their zero carb whey isolate. All of their zero carb proteins have 25 grams of protein. Some of them have about a half gram of fat and some of them don’t: in our collection, Creamy Vanilla had no fat and 100 calories per scoop while the other two flavors had half a gram of fat each. 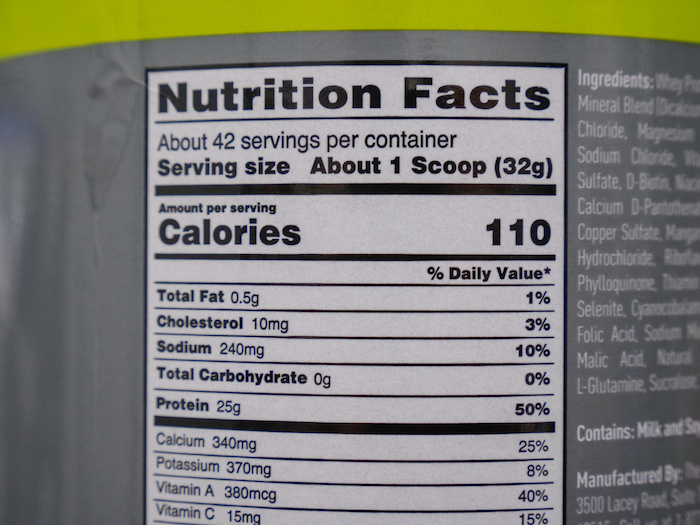 Their calorie counts are at 110, although half a gram of fat should really put it at closer to 105 calories per scoop — not that the 5 calories makes much of a difference at the end of the day. Otherwise, they all have pretty similar nutrition labels. Here’s what the Creamy Vanilla looks like. The flavors vary a little in the micronutrients they offer — Strawberries & Cream has three times the potassium of Creamy Vanilla — but by and large you’re looking at about 30% of the recommended daily intake of 26 vitamins and minerals per scoop of Isopure Zero Carb. Whey isolate, a vitamin and mineral blend, soy lecithin (for mixability), l-glutamine, natural & artificial flavor, sucralose, and xanthan gum (a thickener and stabilizer). They all have the same ingredients, except the Strawberries & Cream flavor has some freeze dried strawberries in it. Who can this benefit? Practically anyone who wants to increase their protein intake while minimizing carbs, especially those who are looking for some extra nutrition because the really remarkable thing about this product, besides the lack of carbs, is the huge variety of added vitamins and minerals. Now, it’s true that the 2-gram carb difference between this and a whey concentrate probably isn’t going to mean that much for most people, but I’ve been on diets where on some days, I had to eat 200 grams of protein and just 50 grams of carbs on rest days. If a lot of that is coming from whey (and you want to eat some vegetables), those couple of grams can add up. This also makes it a great option for ketogenic diets. It’s also free from lacrosse and gluten so it may be friendly on folks with sensitivities. That said it says here that it’s made in a facility with egg, wheat, and peanuts and tree nuts so maybe if you have super sensitive allergies you may not want to take that risk. This makes for a little under $1 per scoop or roughly 4 cents per gram of protein. 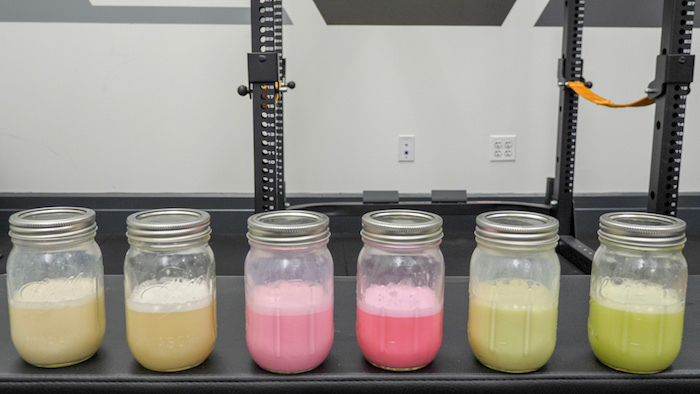 For a whey isolate, that’s inexpensive, and the more you order the cheaper it gets: if you get a big 7.5lb tub it drops to about 3.5 cents a scoop. This is a big upside of the fact that Isopure is part of such a big company: it’s inexpensive, particularly given all the extra vitamins and minerals. 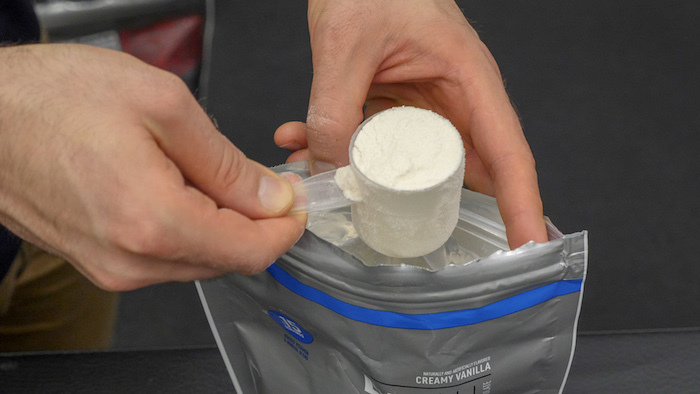 Creamy Vanilla: The thing with zero carb protein powders is that the taste usually suffers. The Creamy Vanilla is a little salty with 10 percent of the RDI per scoop and mixed with milk it was overwhelmingly sweet: like melted ice cream with sugar added to it. When mixed with water it tasted more like watered down cream. It wasn’t amazing, but I preferred it with water. Strawberries & Cream: My favorite shake I made during the taste test: it’s not as strong a flavor so with milk it tasted pretty close to a strawberry milkshake. With water, the flavor was closer to that of melted down strawberry candy. I preferred it with milk. Apple Melon: An extremely unusual flavor, this one tastes a lot like melon liqueur. With milk I actually quite liked it, it tasted a little like Yakult®, a sweet, fruity, yogurt-based beverage. With yogurt it was a lot closer to melon liqueur. Overall, I’m impressed with the product but not as impressed with the taste. But if you need to absolutely minimize carbs in your diet, you may find that minor sacrifice worth it. After all this is inexpensive, versatile, and jam packed with vitamins and minerals. In my opinion the pros outweigh the cons, just don’t expect the most flavorful shake on Earth.